Out of the dark and in to the blue. 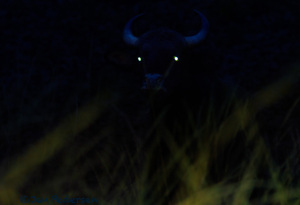 Gaur (Indian Bison) is the planets biggest and heaviest member of the ox-family, Bovidae. Shot at night from a walk outside our lodge inside Kanha NP. I wanted the eyes to shine - diabolically.